Metro Board Member and Los Angeles County Supervisor Michael D. Antonovich on a train pulling into Arcadia Station earlier today. 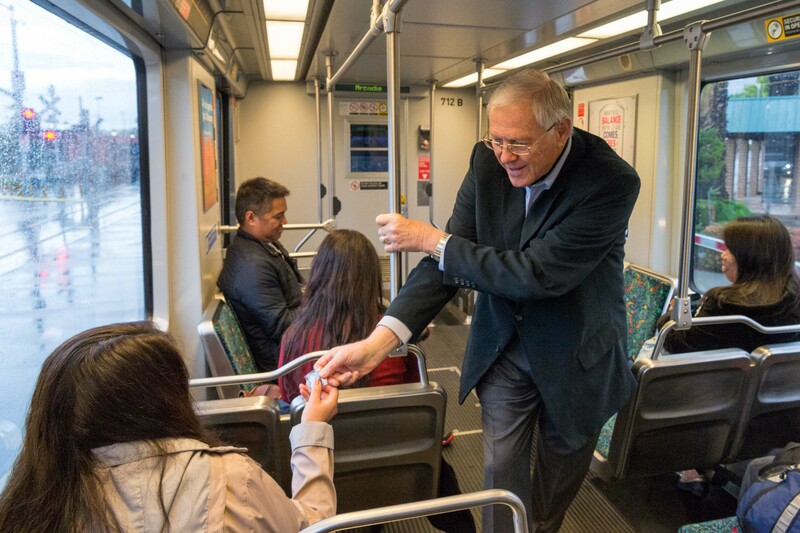 Antonovich has been an ardent Gold Line supporter for many years. 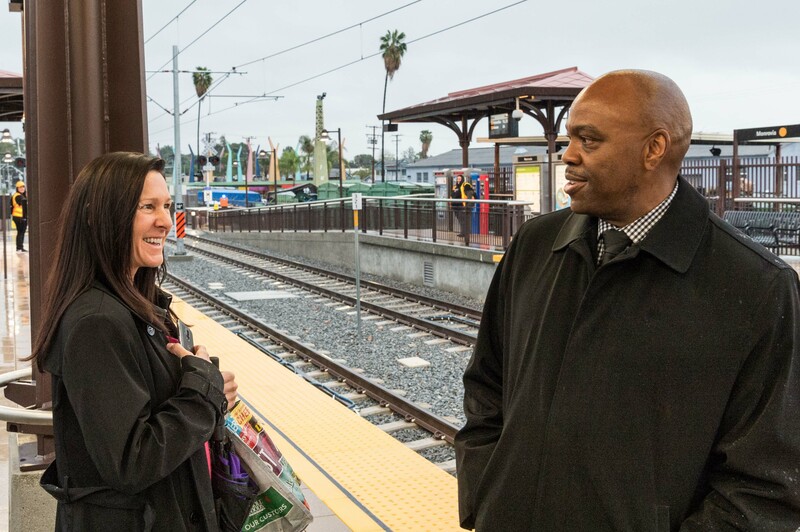 Metro CEO Phil Washington greeting a new Gold Line rider this morning at Monrovia Station. A lot of riders told Phil they were headed to downtown Los Angeles. 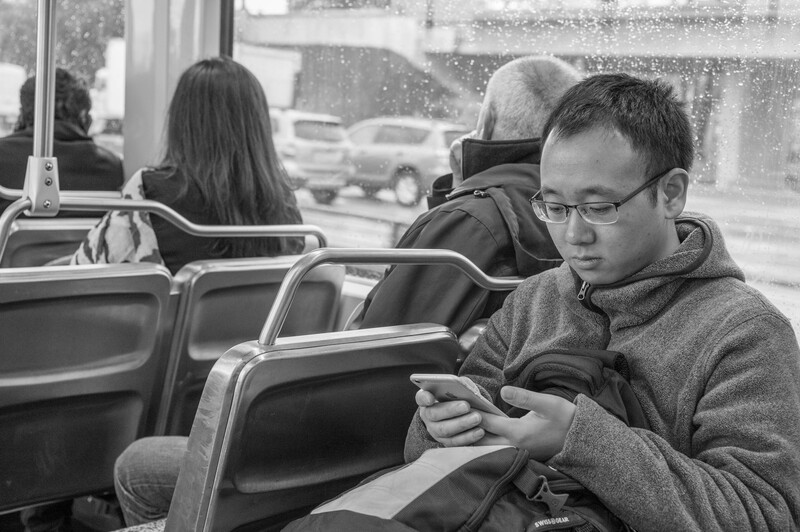 On a westbound Gold Line train during the Monday rush hour. The train is crossing the bridge over the eastbound 210 here with westbound traffic in the background. 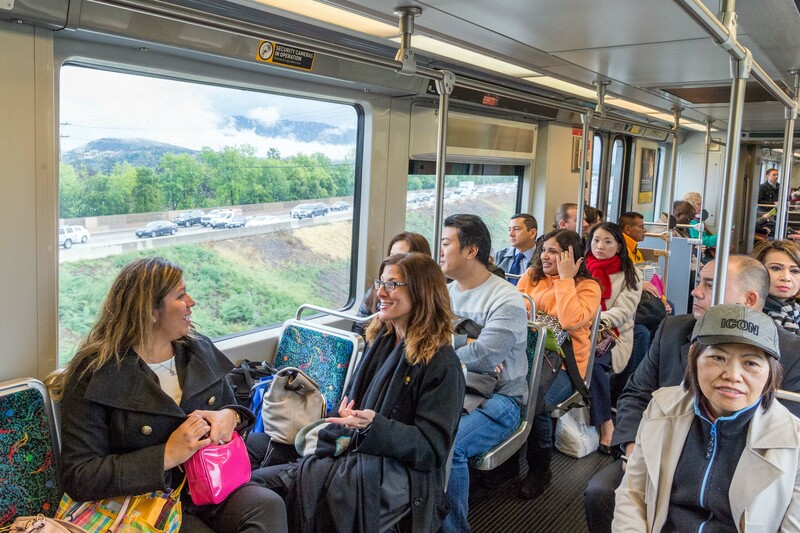 Gold Line riders checking out the 210 during this morning’s commute. Monrovia shortly after 7 a.m. It was both catting and dogging for a few minutes. UPDATED, WEDNESDAY 2:30 P.M.: We are forwarding the feedback you’ve provided to the appropriate departments at Metro. As for parking, the two Azusa stations continue to fill by 7 a.m. or earlier. Field staff checked this morning and there were still spaces left after the morning rush hour at Irwindale and Monrovia stations. Arcadia Station’s garage seems to be filling between 8:30 a.m. and 9 a.m. It remains to be seen how these patterns will hold up over time. But, as we mentioned in the original blog post below, Irwindale seems to be a good alternative for those who can’t get a parking space at the Azusa stations. 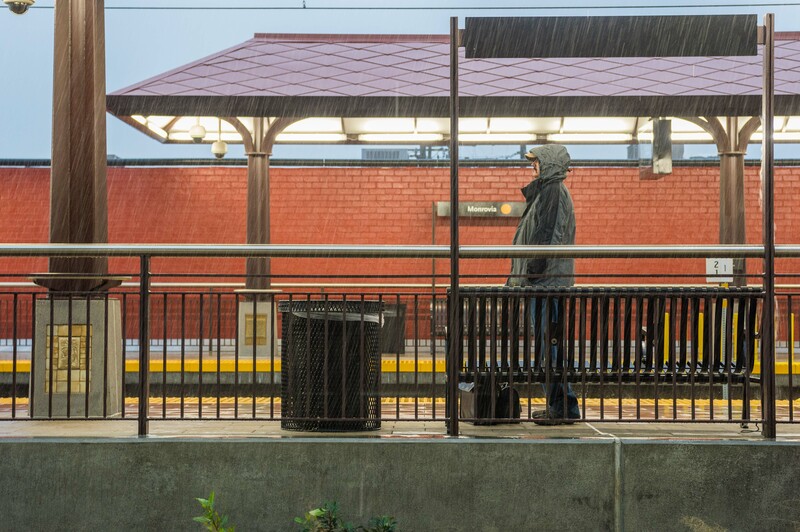 Even with the squall and thunderstorms that blew through the Foothill Cities this morning — and the rain was blowing sideways in Monrovia for a few minutes about 7 a.m. — ridership looked very healthy on the Gold Line extension’s first regular weekday morning commute on Monday. The 11.5-mile extension between Pasadena and Azusa with six new stations is a project, of course, that is intended to serve riders for many decades to come. Judging the project based on one morning commute is probably not fair, but it’s still important to consider everyone’s first impressions. Let’s run through some of the issues raised. I may not have answers to satisfy everyone, but I’ll pass along the information that we have. As far as the issue of longer trains and more frequent trains goes, Metro is saying that ridership will be evaluated and, if warranted, schedule adjustments considered. As for the issue of parking, there are more than 1,500 parking spaces at the six new stations. The cost of building the parking at the six stations was about $48 million. Included in the $48 million was about one million dollars for each of the six new stations to enhance walking, biking and bus connections. It’s not surprising that the most complaints thus far centered on the APU/Citrus College garage since that’s the new terminus of the Gold Line. Metro has seen time and again that the stations at the end-of-the-line (such as Norwalk on the Green Line or NoHo on the Red Line) see a lot of riders and parking demand. The APU/Citrus College Station is just west of the Azusa/Glendora border and it’s likely drawing riders from points east. Bottom line: the demand is going to be heavy at that station. I spoke to a couple riders this morning who said they were able to snag a space at the garage in Azusa Downtown after not finding parking at APU/Citrus College Station. For those coming from the east, the Irwindale Station might be an alternative. It has 350 spaces and is right off the 210 Freeway at Irwindale Avenue. (RELATED: please see this helpful post from the Gold Line Foothill Extension Construction Authority with more about parking availability). We know there still may not be enough parking to satisfy everyone. Metro encourages everyone to look at various options to reach the stations. One thing to consider: there are good bus connections in place for each station — see this post (scroll about halfway down), which lists them all and provides the links to the different bus lines. There’s also drop-off options, bike racks and bike lockers. The larger issue here is how much should any transit agency spend on parking. It’s a tough one that we’ve encountered on other lines, too. We want to make it possible to take transit — particularly in suburban environments. But we also don’t want to spend all the dollars available or surround our new stations with only parking. The idea is to leave room for a variety of community entities. Finally, there’s the issue of some riders being wrongly charged for transferring from the Gold Line to the Red Line. That was a mistake involving the software used to power TAP. I’m told that it was fixed by mid-day Monday. If you were wrongly charged, please phone the TAP customer center at 866.827.8646 and have your TAP card handy. Please see the comments for more rider reaction — and leave your own comment. And here’s our post of pics from opening day on Saturday — lots of good rider images. I also did a photo essay on the cities of the Foothill Extension. I realized that not all station platforms on the Gold Line can accommodate a 3-car train. Does that mean we would never see a 3-car train anytime soon? If not, how would it work as not all doors would be able to open on the 2-car platforms? I don’t believe that’s correct. Three-car trains have been used in the past — i.e. Rose Parade. Three-car trains were running on Opening Day on Saturday. So I’m not sure where you get the idea that the platforms can’t accommodate them. Huh!! What station are you referring to?? To my knowledge, every light rail station in the system has 3-car platforms. My excitement over finally not having to drive to Pasadena every day to catch the Gold Line has been offset by the unpleasantness of overcrowded trains this first week. (And, today, there was a foul odored homeless person that we all had to endure. I tried to report that on the Transit Watch app, but the report wouldn’t upload.) On the days when I have to stand, I end up with pain in my hip and knee joints by the time I get to DTLA. Not the way I want to start out my work day. The drivers of the trains departing Union Station really need to change their electronic exterior signs immediately after they berth so that we know whether that train is Pasadena and back only or going all the way to Azusa. I wasn’t even aware that not all trains were going all the way through until we got dumped at Sierra Madre Villa one night and waited nearly 30 minutes before another train took us on East. (A fellow passenger told me she had checked and the train we were on WAS supposed to go to Azusa) The point is, we need to know at Union Station BEFORE we get on a train where it is going so we don’t board and find a seat only to have the driver announce it is not going all the way through and then have to get off and wait for another train. Changing the outside info on the train right away is something simple that can and should be done to avoid confusion. Part of the problem with the parking structures filling up, in my observation of the years of parking at Sierra Madre Villa is that many, many commuter vans are allowed to park there. I’ve counted as many as a dozen of these vans. If, on average, each van is bringing in 6 – 8 people who are riding the van, multiply that by a dozen vans and you’ve got a lot of parking spaces taken by people who are NOT riding the trains. Those vans should not be allowed. There are park and ride lots for that. Besides the vans and their riders taking away parking spots from Gold Line riders, they also are also a safety hazard, as some of them park right beside the traffic pass-throughs, causing a danger for cars using the pass-throughs because you have to go out where there is oncoming traffic just to see around them to see if it is safe to proceed. Dangerous because some people drive through the structure like it’s a racetrack. You tried to report a foul odored homeless person? Ohhh the horror! Just wait until you have a 5x tear dropped gang member staring at you and making an impromptu rap song about harming the only man on the train wearing too much Old Spice cologne. The point is, the more you ride, the more unpleasant moments await. What about the time when two seemingly sweet gals decided to spray the train car with mace right after the doors closed? Or the time… I can write a book about these moments (actually, ive thought about doing just that). LA Metro is one of the worst light rail/subway/bus services in the western world. But its our only option. Love it or leave it. I’m not going to pretend that mass transit here in the L.A. area or anywhere else is always a perfect environment. That said, the vast majority of transit rides I’ve taken here and elsewhere have been incident free. As someone who has lived in L.A. for 22 years, I can also recall the several times I’ve driven past fatalities on local roads and freeways from vehicular accidents — or narrowly avoided some very scary accidents. I, too, have occasionally encountered some unpleasantness on sidewalks and in other public spaces. I have been riding public transit for a long time. You will see some crazy stuff, but your reaction will depend on who you are as a human being. You can be thankful you are not homeless, you can laugh about some circumstances, you can get off at the next stop and wait for another train, and you can go on with your life. You also have the right to complain about circumstances that no one can control, and you can also avoid all humanity. Personally, I am ok with it, I have things to talk about, and i sure have plenty to learn about. Most rides are just very comfortable and uneventful, but we all need to realize that this is real life and that these folks whether you like them or not, make up part of our world. Just try to be nice, its really not that hard. 6:12 AM Friday out of Citrus station I observed on the arriving train 3, probably homeless, men sleeping on the train with no intention of getting off. There should be some security at ending destinations making sure the train is not just a warm place for sleeping. I love this way of commuting and plan on everyday use. I will recommend it to all that it is practical for. Yes, parking will continue to be an issue but most of us need a little exercise if we must walk a ways from our cars. I do worry about my cars safety knowing some neighbors won’t like people parking in front of their homes every day.